Waterloo – Ten Dehcho high school students from the Northwest Territories will have the chance to learn firsthand about cold regions ecohydrology as well as gain traditional knowledge during a new field course organized by a Wilfrid Laurier University professor. The credit course, which will run from March 11 to 18, will take place at the Scotty Creek Research Station south of Fort Simpson in the Northwest Territories. Students will learn from both elders and scientists about the local ecosystem and hydrological processes. They will use field instruments to collect ecological data and try out drones for imaging purposes. Bill Quinton, who is leading the course, is an associate professor in Laurier’s Department of Geography and Environmental Studies and director of Laurier’s Cold Regions Research Centre. He has been working in the Scotty Creek area since the 1990s. From 2005 to 2015, he was Canada Research Chair in Cold Regions Hydrology and Water Resources. Scotty Creek is one of the fastest-warming areas in the world and local people are concerned about the dramatic changes to the landscape they’ve already seen, said Quinton, a founding member of the Government of the Northwest Territories-Laurier partnership for environmental research. In the longer term, Quinton would like to transform the Scotty Creek Research Station into a locally managed ecological research park that combines research with training and community engagement. This course is a step toward that goal. The Grade 10 to 12 students who will be participating come from Fort Providence and Fort Simpson and were selected by competition, which included writing a letter about why they wanted to take the course. Almost all the students wrote about their grandparents and their concerns about the climatic changes they’ve seen. Some even wrote about the changes they’ve seen in their young lives, said Quinton. 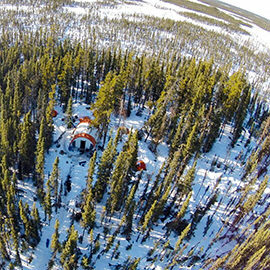 Quinton also has plans for another field course in February 2018, which will involve Laurier undergraduates and northern high school and college students at the Hoarfrost River Homestead on Great Slave Lake. This year’s course is a result of collaboration between Laurier, the Government of the Northwest Territories and the Dehcho First Nations. Grand Chief Herb Norwegian of the Dehcho First Nations will speak to the students about land stewardship. Another elder, Edward Cholo, will teach the students traditional place names and spend time with them on the land. Quinton and other Laurier instructors will teach the students about aquatic ecology and to use scientific instruments for processes such as taking and analyzing snow and soil samples. Students will also learn about forest characteristics and take measurements of tree height, diameter and density, in part by using drones. Students will analyze the data they collect and write reports. They will also participate in all aspects of camp life, ranging from cooking to the important process of informally talking to the scientists and elders and giving their feedback. “We want it to be a two-way flow of information and knowledge in the spirit of the way we hope Scotty Creek will go as a research park,” said Quinton.